Samsung Digital A503 is a 5.0 megapixel point and shoot digital camera that features 5.2-megapixel CCD, 2-inch 115k pixel TFT LCD, 5x digital zoom, 8x playback zoom, 9 different photo frame effects, composite shot mode which allows 2-4 shots to save into a single file, 7 scene modes including Night, Portrait, Landscape, Sunset, Dawn, Backlight, Fireworks and Beach & Snow, PictBridge compatible, 32MB of built-in internal flash memory and uses SD memory card. Samsung Digital A503 measures 3.5 x 1.2 x 2.5 inches and weighs 4.0 ounces. 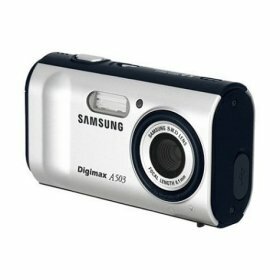 LetsGoDigital reviews Samsung Digimax A503 and concludes that Samsung Digimax 503 digital compact camera gives beginners taking their first steps in the world of digital photography a host of possibilities as well as being user-friendly. Add to this great results and extensive possibilities and the final conclusion is that Samsung has managed to bring a digital camera on the market that has great possibilities, simple operation, excellent results and last but not least, also looks great. I can heartily recommend the Samsung Digimax A503 to any beginning photographer. More features, specifications and sample images at Digimax A503 official homepage (no longer available).